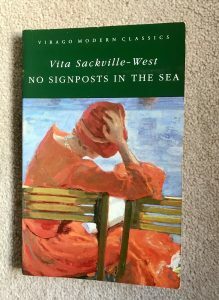 Vita Sackville-West gathered much of the material for this novella on some of the sea-cruises she took annually with her husband Harold Nicholson (they married in 1913) for the last six years of her life. The narrative consists of the journal entries of eminent political journalist Edmund Carr as he embarks on the first ocean cruise – and love – of his life. He observes and records the foibles and relationships of his fellow travellers, from the bridge parties and factions and friendships that spring up on board, to his ventures onshore when the ship docks at exotic locations. In that sense it can be read partly as a travelogue, with vivid descriptions of the ports and islands they visit and pass by, the migrants, crew and social butterflies on board ship, and the ‘natives’ who are sometimes referred to (as are some other ethnic and social groups) in the offensive terms that were still sadly prevalent in people of the author’s class at the time. 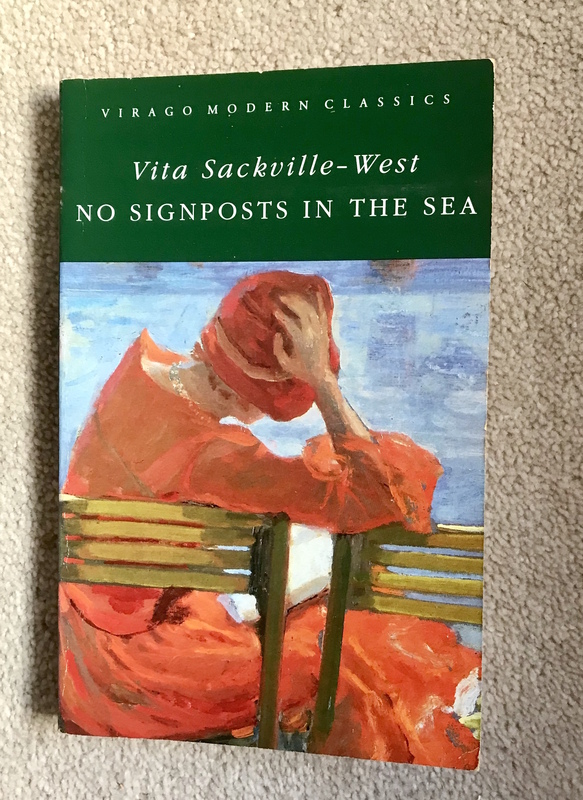 The painting on the cover of my VMC edition is by my namesake, Sir John Lavery – don’t think we’re related, but both our families come originally from Ireland, so who knows?! It’s clear from early on that Edmund has a terminal illness, and has left his newspaper to follow Laura, the woman with whom he’s falling deeply in love. The narrative relates the toxic effects of jealousy to which he’s subject, building with increasing tension to a foreseeable but still powerful conclusion. Along the way there are philosophical and poetical reflections on life (and mutability), death and love. By allowing himself for the first time in his life to go with the flow of existence – he’s all at sea in every sense – because he knows his days are numbered, he discovers in himself depths of romantic sensitivity and an ambivalent attitude towards his often abrasive contacts with the mundane that represent the first stage of self-realisation and fulfilment. The main cause of his jealousy concerning Laura is the handsome and suave Colonel Dalrymple. As the narrative is conveyed from the partial viewpoint of Edmund himself, we initially see this rival as charming and attractive, but as time goes on the Colonel’s attentiveness to Laura causes him great pain. Considering Edmund is fifty and Laura forty, the novella gives a reassuring indication for those of us who are no longer youthful that passion and the pangs of love and jealousy are not the sole province of the young. Victoria Glendinning, who wrote the Introduction to this edition, finds Edmund’s working-class origins unconvincingly done. But I found this an important aspect of his self-delusion. He’s painfully aware that he isn’t one of the ‘well-bred’ cruising class like the Colonel, the quintessential English gentleman – or Laura. He can’t help but feel inadequate in their company, and by comparing himself unfavourably with them, heightens his sense of worthlessness. Otherwise his bitter jealousy would seem less plausible. For example, Edmund records in his journal with a self-directed sneer that he’s ‘a man of the people’, a ‘rough terrier beside a greyhound’. Yet Laura often reveals to us that she admires his poetic nature and enjoys his company far beyond the level of a sympathetic fleeting on-board friendship. It’s the fate of the class-conscious jealous man to misinterpret the very narrative he’s in the process of writing. Laura expresses some interestingly racy views on relationships and marriage that appear to reflect some of Vita’s and Harold’s complicated arrangements. She insists that in a marriage she would treasure her independence, sleeping in a separate bedroom and living an unsubmissive life. Because of the fragmentary journal structure the narrative flows rapidly and rarely flags. There are some memorable and luminous scenes, like the electric storm at sea or the green flash that Edmund and Laura look out for most evenings as the sun dips beyond the ocean’s horizon (this feature reminded me of Eric Rohmer’s 1986 film ‘The Green Ray’ – ‘Le Rayon vert’). I found the depiction of the almost adolescent but scorching angst and torment of Edmund compensated for the slightly clunky plotting. At only 156 pages it’s a pleasant and entertaining way to pass a grey day of hail and rain in a Cornish November.